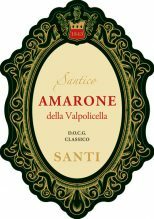 Terroir: The Santi Amarone ‘Santico’ is sourced from estate vineyards spread across multiple terroirs of the Valpolicella region. Vinification: Only the ripest recie (ears) of the grape clusters are harvested when full ripeness is achieved in late October. Immediately following harvest the clusters are dried under shelter in flat wood crates until late January of the following year, greatly increasing natural sugar content and concentration. The dried grapes produce a powerful wine with marvelous flavor which is aged up to three years in Allier and Slovenian oak casks prior to release. Deep ruby red in color with a very slight garnet edge, Amarone has an intense and very complex bouquet with dominant notes of raisins, cherries and bitter chocolate with hints of tobacco and spices. Full and generous on the palate, the wine has a rich yet powerful mouthfeel marked by focused, silky tannins and a long, lingering finish. Ideal with elaborate and robust pasta dishes like pappardelle noodles with hare sauce, game and horse sirloin.